Capt. Ezekiel Baker's Polished Brass Double Frame Presentation Sextant! 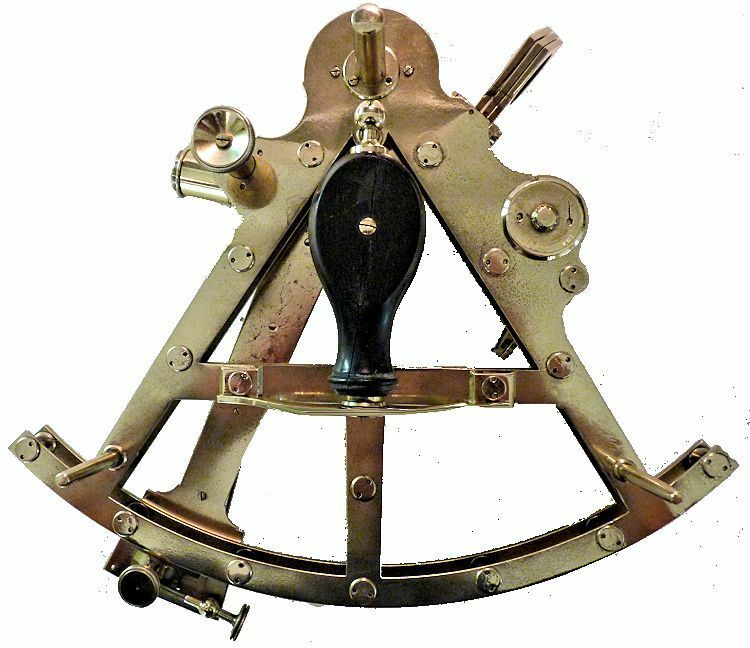 To view our current inventory of high quality antique sextants and navigation instruments, click here! Capt, E.C. 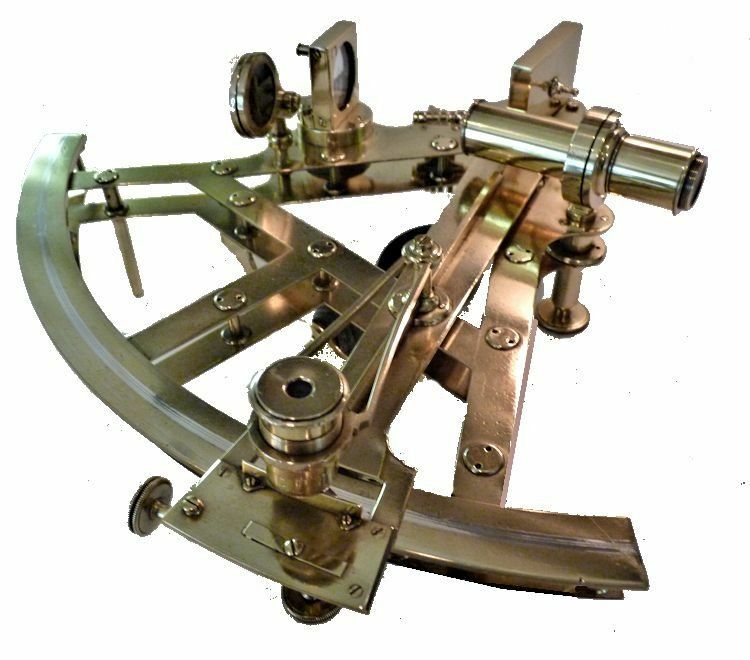 Baker's Polished Brass Double Frame Presentation Sextant! 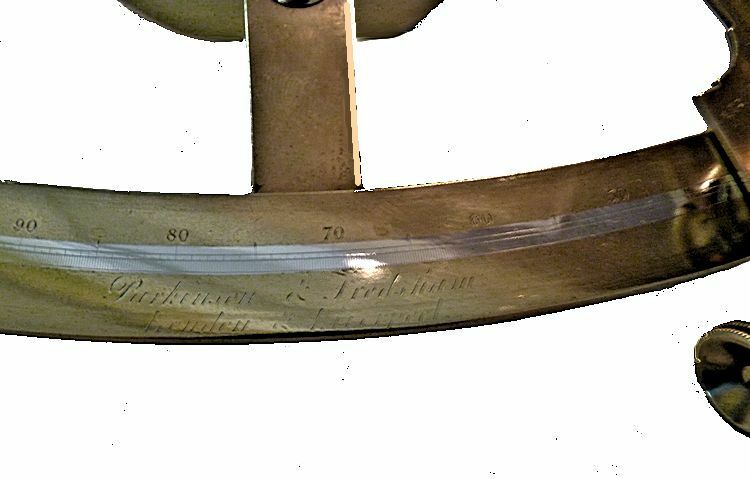 Captain Ezekiel C. Baker's Presentation Double Frame, Polished Pillar Quintant / Sextant! PARKINSON & FRODSHAM were best known for their chronometers which equipped the HMS Beagle on its three survey expeditions starting in 1826 and ending in 1843. HMS Beagle was under the command of James Cook, Robert Fitz Roy (Later admiral) and the for the last voyage by John Clements Wickham. 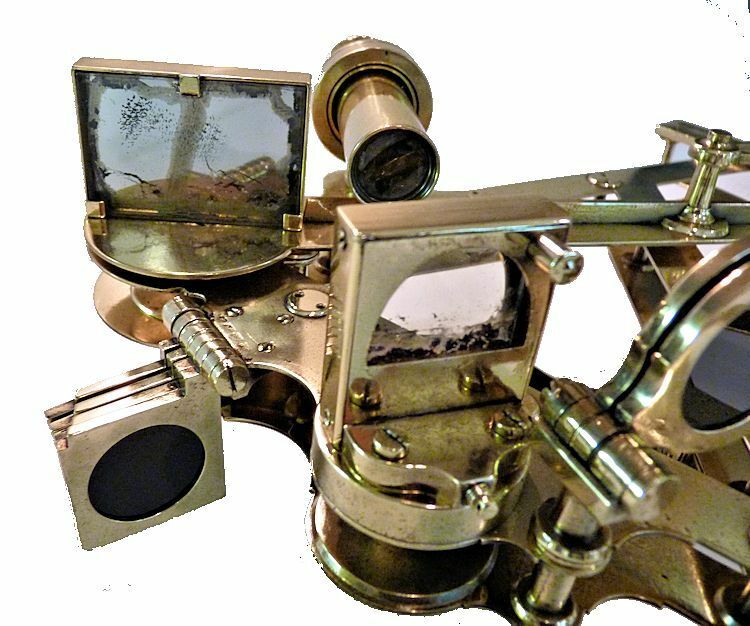 PRESENTED is a double frame quintant or sextant that was owned by a famous New England sailing ship and steam ship captain, Ezekiel C. Baker of Cape Cod, Massachusetts. 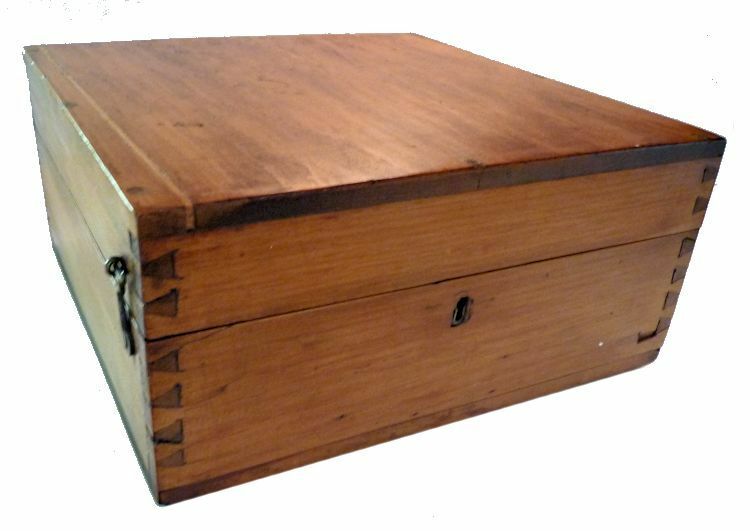 It was made by Parkinson & Frodsham of London and Liverpool, England. It does not have a serial number and may have been made by Troughton. The entire instrument is brass which has been polished and lacquered to a high luster which we believe was the way it was originally made. The distinguished Edward Troughton patented this design in 1788. The instrument's arc is graduated into 150 degrees which classifies it as a Quintant. Brass became the accepted material of choice for sighting instruments in the later 19th Century because of its strength and durability. 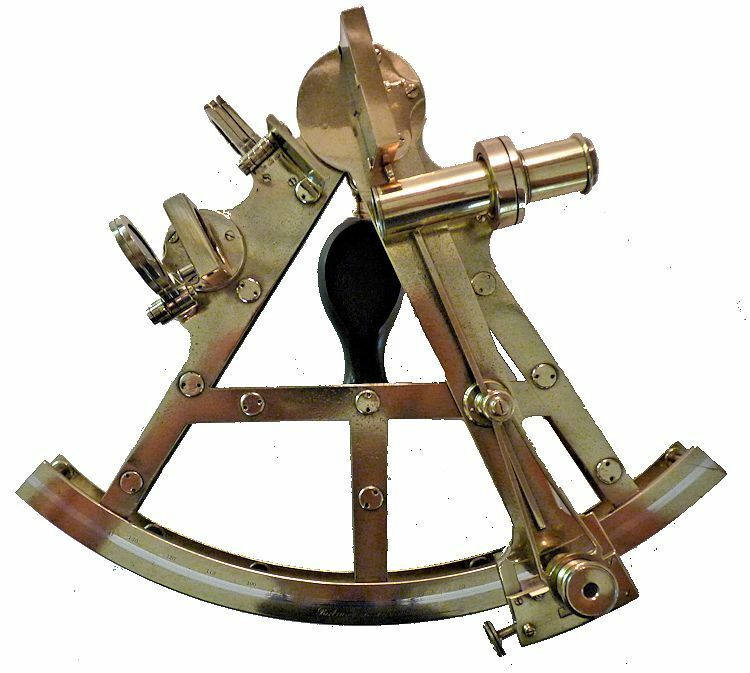 Double frame sextants were expensive to make and never gained the popularity of the more common single, cast-framed instruments. Consequently, they infrequently come to market and this one is very important because of the provenance of its original owner. 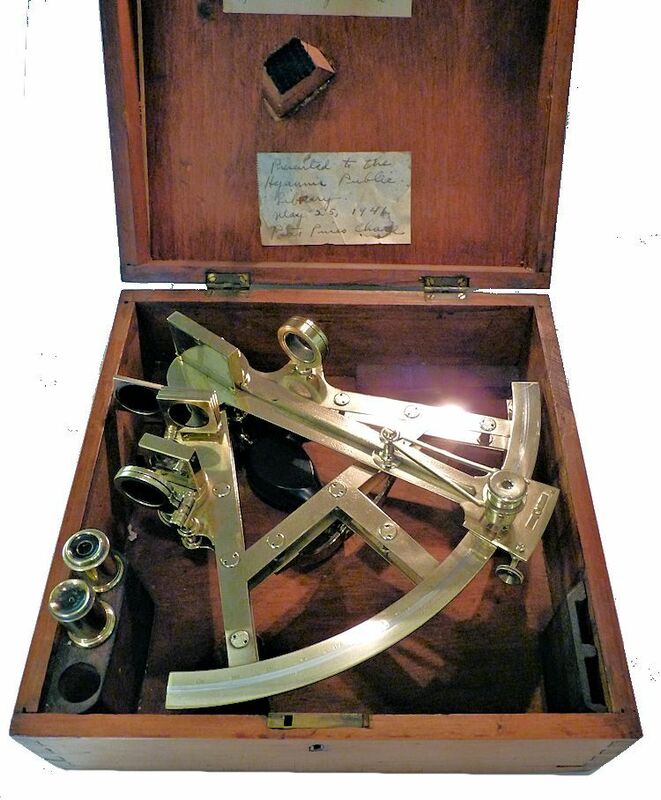 Double frame instruments are very rare and special so they can be considered a wonderful reminder of navigation instruments of the last quarter of the 19th Century. 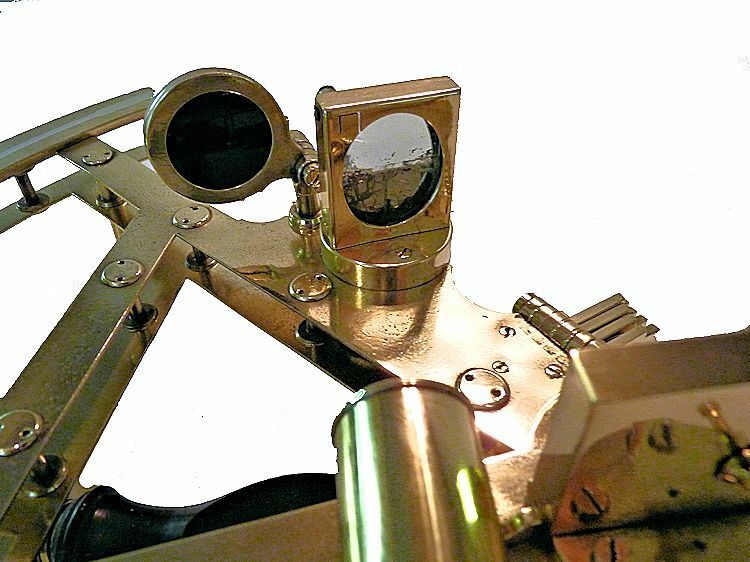 The sextant has two straight bar pillar frames that are held together with twenty one pillars, and various screw fittings. There is a turned Ebony wood handle. The tangent screw and clamping screw are positioned on the back of the index arm. The device has three square index shades, and two round horizon shades. The telescope is attached to a perpendicular rising-piece which is adjusted in and out by a milled knob. There is also a magnifier traveling over the vernier. The single telescope presents an inverted image. The brass limb is inlaid with a sterling scale from -5° to 150° divided each 5 degrees. The sterling vernier measures from right to left from 0 to 10 in arc seconds. This is a one time opportunity to acquire an extremely rare presentation grade double frame, pillar, instrument made by Parkinson & Frodsham, one of England's most distinguished instrument makers and owned by the distinguished mariner, Captain Ezekiel C. Baker! INSTRUMENT & CASE CONDITION: The telescope displays the image upside down which was not unusual for astronomical use. Both mirrors, considering their age, are in fair to good condition. The swing arm magnifier is complete and in good working order, and slides up and down for focus. Both sets of shades, i.e., filters are in perfect condition. The endless tangent screw does not turn because of the lacquer coating The horizon mirror adjusts by turning a screw and the index mirror adjustment requires a screw driver which is missing. The case is in excellent condition and the varnish has pleasant patina of age. There is a pocket for two lens caps on the right side which are empty. There also was a wood slot, but the wood was glued to the base improperly and the sighting tube is missing. Parkinson & Frodsham, a firm primarily known for trading in high-quality chronometers, clocks and watches, was established in 1801 by William James Frodsham (1778-1850) and William Parkinson. Frodsham came from a long line of watchmakers. He was the grandson of William Frodsham, who was taught by Earnshaw, and his mother was the granddaughter of the famous John Harrison, the inventor of the first marine chronometer. He was also the father of Charles Frodsham. William Parkinson died in 1842 and William Frodsham in 1850. From 1801 to 1890, the firm’s business address was 4 Change Alley Cornhill, London, and thereafter at other addresses until 1947. Ref. This maker is is listed in Sextants at Greenwich", "Sextants at Greenwich" by W.E.J. Mozer Bruyns, which catalogs the collection of the British National Maritime Museum at Greenwich, England. 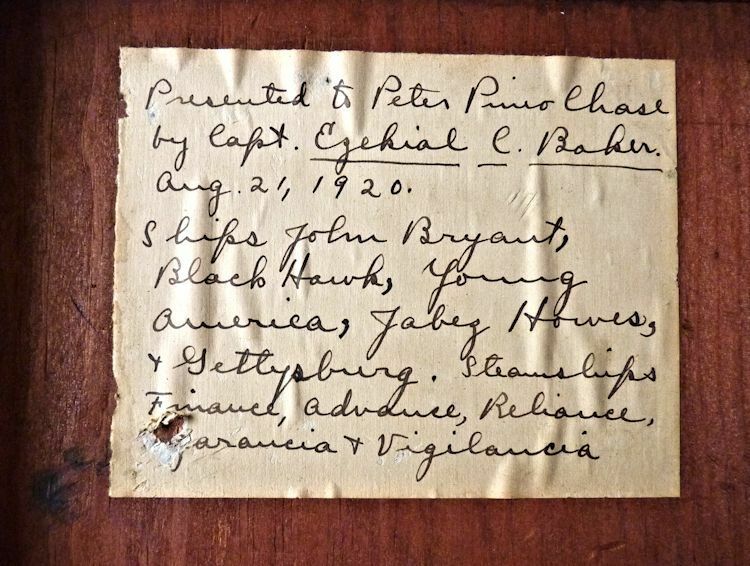 The long deceased Captain Ezekiel C. Baker belonged to that large body of noted sea captains who did successful commercial service and of whose records Cape Cod has ever been proud. They were well known and their arrival hailed with interest in every port; they will ever hold a conspicuous place in the annals of the Cape. Captain Baker was born in South Yarmouth, a son of Frederick and Hannah (Hallett) Baker. His two brothers, Fred P. and Horace, both deceased, followed the sea in their day. Captain Baker married Miss Mary Gorham Crowell of West Yarmouth, who survives him. Their fiftieth marriage anniversary occurred about a week ago. An only son was Dr. Chester M. Baker, who died in December 5, 1914. Capt. Baker, like so many others, began going to sea at the age of fourteen years, and at once on foreign voyages. He rose early to the position of captain and among the ships he commanded were the John Bryant, Jabez Howes and Young America, all merchant ships. Later he entered the mail and passenger steamship service between the United States and Brazilian ports, carrying also miscellaneous cargoes. Sailing between New York and Brazil, every sixty days he arrived at the latter port. At the time of the conflict in Brazil his services were sought by that government and he was made Commodore of the fleet of eight ships purchased at that time by the Brazilian government of the United States and which entered Brazil with flying colors. News of the coming of the fleet had preceded it and it was met by the insurgent's flag of truce. To Commodore Baker it was a great satisfaction that the conflict ended peacefully and without bloodshed. Captain Baker's career was free from accidents. On many of his voyages Captain Baker was accompanied by his wife who has seen much of the world with him. Eleven times Mrs. Baker went around Cape Horn. She traveled much with the Captain in England, and went across the continent tree times to join him in California. She also went with him on South American voyages and visited many of its cities. Captain Baker's career and journeys have been of marked interest, and his accounts of voyages and descriptions of places visited have thrilled many a group of intimate friends as he modestly related seagoing experiences. Captain Baker retired from the sea and after extended foreign traveling was content to spend the time quietly on land, a part of the time in South Yarmouth, a part in West Yarmouth and his last years in Hyannis. CERTIFICATE: There is no certificate which is customary with old instruments. Length of index arm 10 1/16"
Radius of arc 9 1/8"
Width of frame at arc 11 1/4"
CASE: 11 1/2" x 11 1/2" x 5 1/8" Weight 3 lbs. 11 oz.